A young man struggles to tell his family of his impending death. Xavier Dolan has had enough said against him as a person that I deem it only fair to steer clear of any personal criticisms of the director himself while roundly panning It’s Only the End of the World, a shrill, pithy, wrongheaded film. 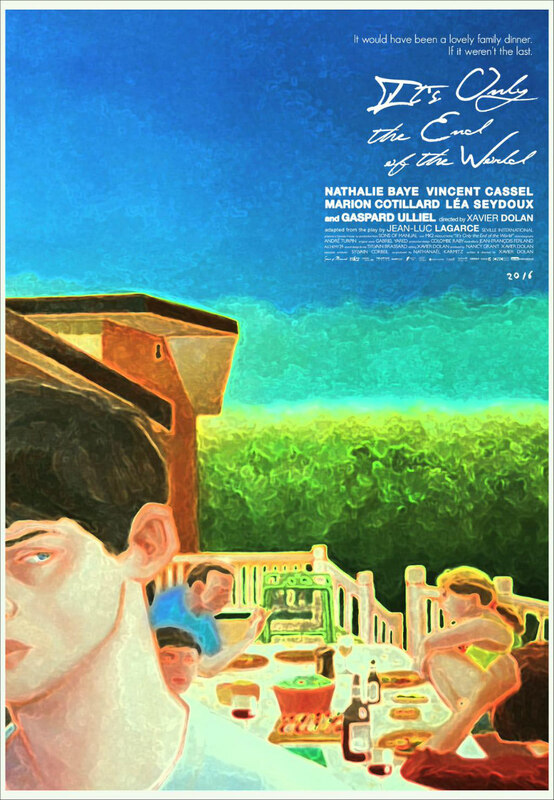 Critics may have treated Xavier Dolan a little unfairly after the Cannes premiere of his newest film, It’s Only the End of the World. Because he’s so young (27), I think some were eager to see the Quebecois director come out with an unmitigated flop, and his not taking the criticism especially well stoked the scathing passions of some critics even more. I’m certainly not above criticising artists for bad form if there’s a direct and obvious relationship between their behaviour and their art, but Dolan has had enough said against him as a person that I deem it only fair to steer clear of any personal criticisms of the director himself while roundly panning It’s Only the End of the World, a shrill, pithy, wrongheaded film. 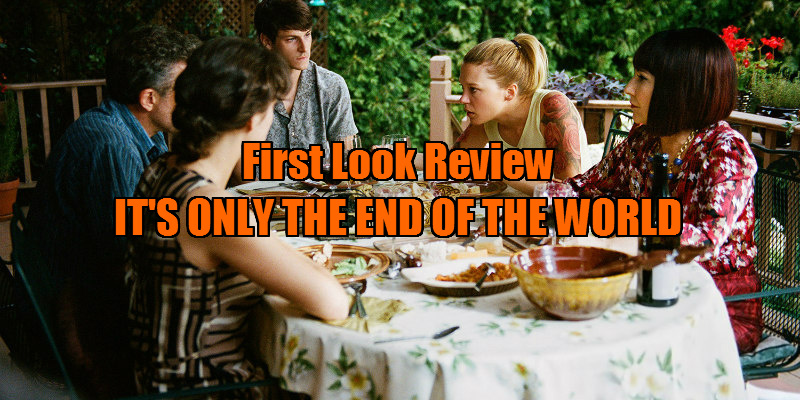 Based on a play by French playwright Jean-Luc Lagarce, It’s Only the End of the World follows Louis (Gaspard Ulliel), a young man who returns to his childhood home to tell his family, from whom he’s estranged, that he’s dying (of AIDS, it’s suggested). As is imaginable, the task is difficult for Louis, especially considering he can barely get a word in edgewise: his mother (Nathalie Baye), his sister, Suzanne (Léa Seydoux), his brother, Antoine (Vincent Cassel) and Antoine’s wife, Catherine (Marion Cotillard) all criticise Louis for his desertion of the family and soulfully confide in him given his unexpected reappearance into their lives. Meanwhile, his painful existential struggle rages on. I can’t speak for the quality of Lagarce’s play, but the main problem with its filmed version is that Louis’ family is a pack of babbling bores. This in and of itself does not preclude a work from being great: the same could be said about the Tyrone family in Eugene O’Neil’s chef d’oeuvre, Long Day’s Journey into Night. The problem is that each member of Louis’ family is the same kind of babbling bore, which is a shame given the diverse skill of this wildly talented cast. An early scene in which Louis listens to Suzanne explain life at home as the two sit in her bedroom is fine, but it soon becomes clear that this idea will be repeated ad nauseum: the family talks talks talks at Louis (not with him), explaining their own neuroticism with clinical clarity even as the film paradoxically condescends to them - painting them as backwards basket cases when compared to the dying black sheep of the family. In the film’s single worst scene, Antoine verbally accosts Louis for his attitudes towards the family as the two go out to buy cigarettes. Vincent, a supposed rube, repeats more or less the same on-the-nose point with uncharacteristic literary flair - and this noisy one-sided exchange drags on for an inordinately long amount of time. The loquacious quartet of characters spell out the nuances of every relationship dynamic, something that not only saps the viewing experience of any interpretative pleasure but also makes the characters ring echoingly hollow (the film’s few defenders have chalked this up to stylisation. But the film doesn’t have the sense of aesthetic boldness to indicate that this would be the case). The problems aren’t unique to the family: as Louis, Ulliel is not given much to do. He’s supposed to be the intellectual of the clan and the only member to break free of their self-imposed prison of loud nincompoopery, but if their perpetual yammering feels tiresome, so does his haughty silence. In moments where Louis mugs quivering puppy dog eyes while reflecting on his own impending fate, we don’t get the depth that the film seems to strive for. Instead, Louis seems to look down upon his family, an attitude that the film condones without ever justifying. You can feel a real pang of woe when he comes close to telling his family he is dying, but the honesty in these few moments is quickly thwarted by more uninspired braying. It’s Only the End of the World, through its inability to break from the theatrical form of its source material, leaves us with nothing but Louis’ specious superiority and the ridiculousness of his squawking family. The film chokes on its own fake characters. Dolan, more than any other young director, has a knack for making his movies convey their emotional power with the same earnestness of pop music. For those of you who despise the inanity of pop music, this probably sounds like a turn-off, and more sympathetic I could not be. But part of what has made previous Dolan movies special is that they can deliver the kind of pure emotional effect that pop songs can inspire while staying well above their simplistic level. He’s an operatic director for a generation of filmmakers who direct more music videos than operas (as Visconti, Bergman, and Huston had all done). You only have to observe the formal beauty of Dolan’s video for Adele’s 'Hello,' an insubstantial pop song if there ever was one, to understand this point. It’s Only the End of the World may reveal that this mode has its limitations; it seems that Dolan tried to fulfill the artistic potential of the material by stuffing the film with would-be profundity and close ups of France’s brightest and hottest international stars, faces twisted with “emotion.” The director’s pop sensibility, a winning quality in the past, doesn’t mix well with attempted loftiness. The best sequences are Louis’ flashbacks. In showing family scenes and a wistful moment of his young shaggy-haired lover sneaking in and out of his house, Dolan manages to capture a powerful nostalgia of a youth that will soon be forever forgotten. These scenes are bathed in a warm visual glow with stylised compositions that prove that Dolan knows how to put together effective visuals, even if watching the blasé blankness of the rest of the film would suggest otherwise. The strong moments show that Dolan needs to infuse his films with more motility: Anne Dorval could spar beautifully with her character’s son while moving about a street or in a store in Mommy (2014). Dolan himself could strikingly convey his character’s perverse sexual fascination with Pierre-Yves Cardinal’s character in the open roads of Tom at the Farm (2013). It’s Only the End of the World is largely trapped in one small house, stale and dusty, washed out with a hazy grayish light. Dolan’s forthcoming star-studded English language film, The Death and Life of John F. Donovan will be released next year. Hopefully he’ll take his material outside and let his characters move and breath again. Plus he’s young! Fellow Quebecois director Denys Arcand was all of 45 by the time he released The Decline of the American Empire (1986), his masterpiece. So Dolan fans, no need to despair - there’s still time. Though it’s not good, It’s Only the End of World may only be the beginning.